I reckon I could also call this an update on Jasmine. In general, I'd have to say that she's doing well. It's hard to tell how much improvement there's been. The sore is no longer oozing and the teat is gradually getting less hard. Treatment includes the antiobiotic injections prescribed by the vet. However, I have only nominal faith in allopathic medicine, and so I have added more natural means of promoting healing as well. One is garlic, which I liquefy with water in the blender, a couple of cloves per 1/4 cup water. This is administered orally, 10 cc in a 12 cc syringe. Fresh garlic contains sulphur compounds, specifically allicin, alliin, and ajoene. These are what make it a powerful anti-bacterial, anti-viral, and anti-fungal agent. She doesn't like it, but gets a nice chunk of apple following dosing. The other thing I'm doing is massaging the teat several times a day with an herbal salve. I made it with dried powered herbs, beeswax, and vegetable oil. For this preparation I'm using herbs that promote tissue healing. It is not my formula, but rather comes from Dr. Christopher via H.E.A.L. Marketplace: white oak bark, comfrey, mullein, marshmallow root, black walnut hulls, gravel root, wormwood, skullcap, and lobelia. For the vegetable oil, I chose food grade grocery store vegetable oil. My personal choice for cooking oils are coconut and olive. 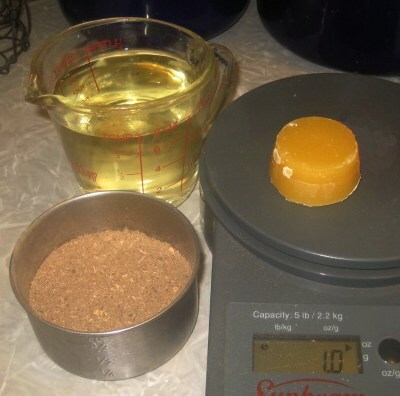 Both of these are often used in salve making, but both also solidify in cool temps (Coconut at 77º F / 25º C, and olive at 36º F / 2º C). Since the salve contains herbs, it needs to be refrigerated to keep it from spoiling. I needed an oil that wouldn't solidify under refrigeration. The choice of oils is largely dictated by personal preference. Ones that I would definitely not use are mineral oil, petroleum jelly, and/or paraffin. I know these are considered food grade and are common in cosmetics, skin care products, and medicinal preparations, but the problem is that they coat the skin. Petroleum molecules themselves are too large to penetrate skin pores, but whether or not they block penetration of the healing properties of herbs and other ingredients is the subject of some controversy. For that reason alone I prefer to use vegetable oils and beeswax, but besides that, I'm trying to eliminate as many products containing petroleum as I can. James Green, in The Herbal Medicine-Maker's Handbook, also suggests using food shortening as an alternative for oil and beeswax. We don't use hydrogenated oil in our diet, so I don't keep the stuff around. Still, it never goes rancid and might make a good emergency backup. I get the beeswax locally, as you see it on the left. It runs $5 a pound around here, so that cone on the left cost a little under $2. Someday of course, I hope to have my own beeswax. The first step is to make an herbal oil. 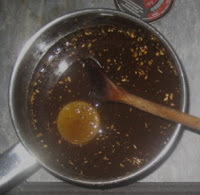 This is done by mixing the herbs in the oil and allowing them to steep in warm oil. The oil must be kept below the simmering point as a safety precaution. Consequently it requires several hours steeping in hot oil. For some things, I like to powder my dried herbs. The reason I powder my herbs is to expose more of their surface area. I believe this enables more of the medicinal properties to be infused, into oil in this case, or into alcohol or vinegar for a tincture or tonic. To powder my herbs, I have dedicated an inexpensive electric coffee grinder (left) for this purpose. It works really well and is easy to clean afterward. Next the herbs can be strained out. Mine being powdered however, probably wouldn't strain out, so I left them in. This particular herbal combination is recommended as a poultice anyway, so I don't mind the herbs being left in the salve. 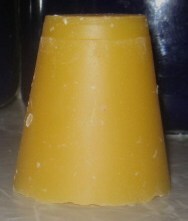 The beeswax is allowed to melt in the herbal oil. I left it as a chunk, but chopping it into smaller bits would melt it faster. 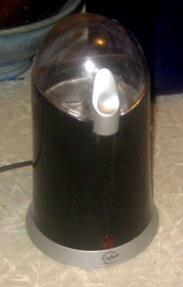 Once melted, the concoction is poured into a container for keeping and allowed to cool. If properly done, it should be a nice, salve-like consistency. Testing of consistency can be hurried a bit, by placing a small amount in the fridge to allow it to cool more quickly. If too soft it needs more beeswax, if too hard it needs more oil. I didn't test it that way, and my salve was still a bit thick. Rather than adding more oil however, I added aloe vera gel, which I've found to be very healing for skin problems. In addition, I added a little cayenne pepper, to stimulate blood flow to the area. When I give Jasmine her garlic and apple, I also wash her udder with warm water and soap, rinse, and then massage the salve onto the affected teat. She'd rather I didn't do this, but she tolerates it (and me), especially if she's distracted with something to eat. The good news is that she no longer flinches when I touch it. For now I'll administer the antibiotic as prescribed by the vet and continue the rest of the treatment until she's healed. 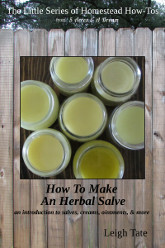 And while I'm at it, I'll put in a plug for my little eBook, How To Make an Herbal Salve: an introduction to salves, creams, ointments, & more. It gives more detailed clear directions plus discusses herbs, other ingredients, plus covers creams, ointments, and more. Very interesting. I hope it works. Sounds like she's improving with your TLC. Time will tell. That is really a neat process. I have our own beeswax and yet to do anything with it. So I enjoy seeing all the ways it can be useful. Tami, time and patience. :) Some things are just slow to heal. Diana, you can use it similarly to make your own hand creams. For that I'd strain the herbs out, but there are many lovely herbs that are beneficial to the skin. That's on my list of things to do next year. Methinks that with your TLC and conscientious efforts Jasmine is going to make a complete recovery! Seeing your comment to APG, I was wondering if the salve is having any noticeable effect on your hands! Thank you for sharing the information on the herbal salve, my wife is very interested in this. I like your thoughts on using shortening as a cheaper alternative. Very interesting. I had purchased some skin healing salve recently from the Amish. It's called chickweed healing salve. The ingredients are....chickweed,comfrey,mint,olive oil,beeswax,lavendar,rosemary and eucalyptus. I jist wanted to share. I can imagine all the herbs of possible use and the talent to know how to make salve. I will just purchase it rather than make it. Loved your post. Very informative. Good for Jasmine!!! And good for you for being such a good provider to her. Mama Pea, that's where my faith is. In regards to my hands, I have to completely wash them afterwards because I'm dealing with an infection. I really should make some of my own slaves though, because I have terribly dry skin and the kinds of hand creams I like are very expensive. Toodie, there you have it, beeswax and olive oil. All the herbs sound wonderful and I imagine that the salve smells good too. You are certainly giving Jasmine every chance of healing properly! I hope all your ministrations work. When I make lipbalm, I always use beeswax as part of the recipe. Not only does it thicken nicely but adds a lot of extra healing potential. I always lean a not when I visit your blog. I'm so happy Jasmine is doing better!!! Nina, I love beeswax for that reason as well. Do you have instructions for making lip balm on your blog? Renee, time will tell. She's a good goat and at the very least would make someone a good pet.